This documentation will explain in detail how to use the Bit.ly integration. 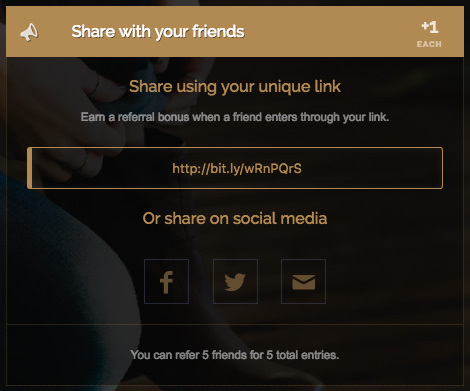 The Bit.ly integration allows you to to use your own share links in place of our default swee.ps share links that are generated for entrants when they enter the promotion. The share links show up under our share with friends social action. Once you have added your access token, we will start providing entrants with a Bit.ly share link. If you've already entered the sweepstakes before implementing the Bit.ly feature, we will not change your share link from swee.ps > bit.ly. This integration would work for new entrants only. Still having trouble with setting up Bit.ly? Simply click the support or live chat icon to get in touch with us.